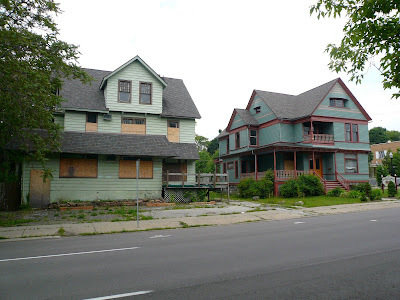 An abandoned home at 519 Garland Street in Carriage Town is being transformed into the Urban Alternatives House with funding from the Genesee County Land Bank and UM-Flint. It will become a classroom space for university students, the community and visiting school children, according to the project website. The house will maximize energy efficiency and introduce sustainable, innovative ways to manage energy and water use. In the lot adjacent to the house a vegetable garden will be planted to encourage more active and healthy living and provide a demonstration site for urban agriculture. the house on the left isn't quite fully furnished. While the outside has been nicely restored, the interior is still in really rough shape. The carriage town neighborhood association, which owns the property was scheduled to get nearly $180,000 worth of stimulus money to finish the interior and transform it into a historical resource center and possibly commercial space......but the city decided it was going to do its own thing with the grant money. lets see what the deem as more important. Thanks for the clarification. I switched it to "partially restored" in the cutline. The outside looks so great I just assumed it was completely overhauled. My grandfather's house had a porch like that. I love "L" shaped porches. Check out the Urban Alternatives House blog for the latest news!